The steep temperature difference between internal house air and external fresh air can often result in condensation around inlet openings or in the attic of the barn. Aside from being a bit frustrating to fix, it can have a serious consequence on your flock health and performance, because they are not receiving the fresh air they need to perform. Condensation occurs where warm and cold air meet. All air contains some amount of invisible moisture – we describe this is terms of relative humidity. Warmer air holds more water than cooler air, and for every 20°F air is cooled, its moisture-holding ability is halved. For example, if you have 80°F air with an RH of 60%, and you cool that air to 60°F, the RH would double to 120% – the result is that 20% of that moisture comes out of suspension, forming visible water droplets (condensation). When using minimum ventilation during the winter months, there are frequently a stark difference in temperature around inlet openings, something especially noticeable in a loose house. Sidewall inlets must have a sufficient opening and be operated at a high enough static pressure that the cold incoming air makes it all the way to the center of the house, rather than lingering near the opening and dropping to the floor. If the openings are loose, condensation will form where air is seeping though. This condensation, in especially cold temperature overnight, can freeze the inlet shut. To prevent this from happening, always ensure house tightness at the beginning of the cold weather season. 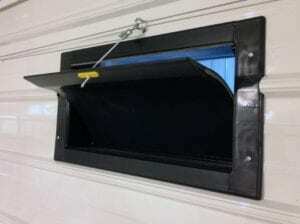 Check around inlet openings for air leaks and seal them tight. Check fan operating power and house static pressure to ensure that air will be thrown to the center of the house and adequately mixed before dropping to bird level. And choose inlets that are made of thicker materials with higher R-values (insulation level). Lower R-value inlets (such as metal inlets) are more prone to condensation and freezing.